I mentioned yesterday that the newly translated (by Neil Smith, forthcoming in October in the U.K. from Hodder) crime novel by Mons Kallentoft (Midwinter Sacrifice) has a unique style that (at least for me) demands a certain style of reading. 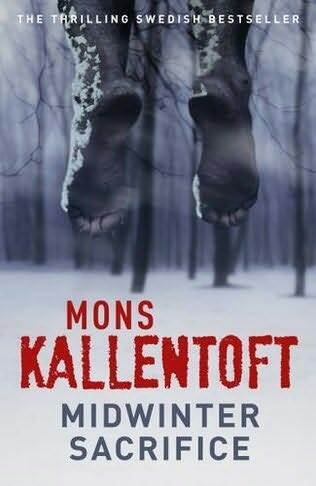 The text is frequently allusive and features numerous passages from the point of view of the corpse discovered at the beginning, hanging naked, tortured, high in a tree in the frozen forest near Linköping. The language varies considerably from the fairly straightforward interactions among the police to the very fluid narrative passages, frequently told in sentence fragments. The style suits the story, which involves urban-rural conflicts and contrasts, cults and the revival of old religions, and the damage that families can do to children. The lead detective, Malin Fors, is a single mother (with a teenage daughter and all the conflicts that that implies). Her colleagues are a distinct group of mostly pretty normal police officers, each with his or her own quirks. The corpse, however, was a damaged man, who seems disturbed and perhaps autistic (though the term is never mentioned) eccentric, if seen from the outside (his monologue after death is surprisingly normal). I tend to appreciate a fairly straight style in crime fiction (allusive, certainly, but perhaps not fragmented in the more poetic style that Kallentoft employs), but Midwinter Sacrifice was very engaging once I got used to the shifts between voices (the narrator's, the corpse's, even a tree at one point) and the dialogue (very realistic) among the cops. The conclusion involves a race to save a trapped victim, but in a way that turns that convention of the thrilling ending upside down and inside out, while also leaving enough unresolved to lead forward to the next installment... Plus I found myself thinking of Sara Lund (from the Danish TV series The Killing) while in Malin's company—a reference that's also made in the back cover blurbs and a comparison that isn't quite accurate but still suggests something of Malin's personality and the tone of the book as well. For a country that is on the whole quite secular, it's interesting how many mysteries/thrillers feature religion taken to extremes.